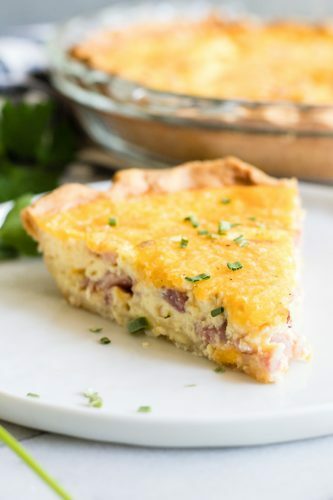 Ham and Cheese Quiche. The classic combination of ham and cheese is sure to make this quiche a new family favorite! Easy to put together, this dish is perfect for brunch, breakfast, or even dinner! Hey everyone, Serene from House of Yumm here again. 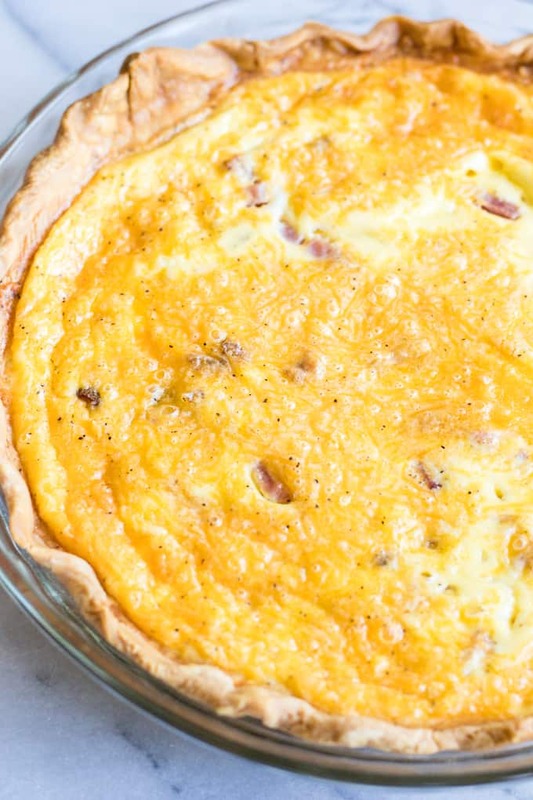 Today I’m bringing this Ham and Cheese Quiche! I absolutely love to make quiches. They are so easy to put together and you can customize them with any fillings that you want. Keep the ratios of the egg to cream/milk. This creates the custard-like egg filling. A good quiche doesn’t need any cheese. The easiest way to do this is to use a large measuring cup. Put one egg in and then add cream or milk to bring the total amount to ½ cup. For example, if you’re using 5 eggs like this recipe that means we should have a total amount of 2 and 1/2 cups of liquid using eggs and milk or cream. Next, dry all your filling ingredients. Make sure that the ham is nice and dry before adding to the pie crust. Just pat it down with a paper towel. Last! Make sure that you blind bake your pie crust. Just bake it a little bit before adding the other ingredients. This keeps the pie crust nice and flakey, not soggy. Preheat oven to 350 degrees. Roll pie crust out and fit into 9 inch pie dish. Trim any excess crust and flute the edges. Line the inside of the pie crust with parchment paper and fill with pie weights or beans (I use pinto beans) make sure that they are up against the sides of the pie crust. Bake the crust for about 20 minutes. Remove the weights and then bake for another 10 minutes. Remove from the oven and allow to cool. The crust will be golden. Prepare the egg mixture by adding the eggs to a large measuring cup. Add the heavy cream, then add the milk, the total measurement of the eggs, cream and milk should come to 2 and ½ cups. Add the salt and pepper. Mix with a hand mixer to ensure the egg and cream mixture is completely mixed. 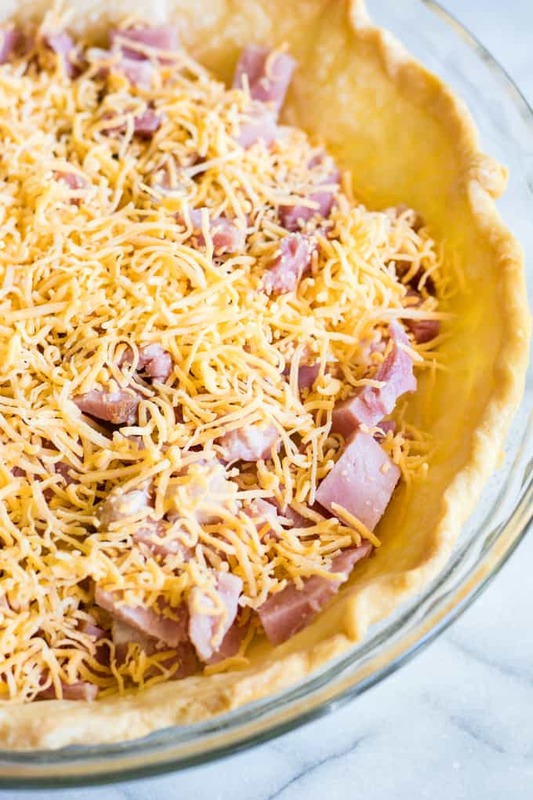 Spread the diced ham and shredded cheese on the bottom of the pie crust. Pour the egg mixture on top. Bake at 350 degrees for about 45-50 minutes. The quiche will be slightly wobbly in just the center. Allow to cool for about 20 minutes to room temperature. Quiche can be served warm, cold, or room temperature. ***Total measurement of eggs, cream, and milk should come to 2 and ½ cups. Follow this guideline over the amount that is shown in the ingredients list. ***Blind baking the pie crust ensures that the crust remains flakey and doesn’t get soggy from the quiche. The extra time is well worth it!